Of course, growing up and having visited Rock City Gardens & Lookout Mountain many a time, we had to show our kids around. A quick drive up the mountain had the kids excited to see what was at the top. The coolness of this place never gets old. I still find myself fascinated by everything up there. The trails feature massive ancient rock formations, gardens with more than 400 native plant species, and you can’t miss the breathtaking “See 7 States” panoramic view. But, before you get to the cliff’s edge to see those seven states, take your time exploring the trails that take you through the rock formations. You may have to squeeze your way through some spots and duck your head in others, but the trails take you all around the area in and out of the rocky side of the mountain. Our most favorite part of it all is the Fairyland Caverns. Deep inside the cavern you’ll carefully travel a dark path (with lighting at your feet) to see little alcoves featuring black light sculptures of your favorite fairytales. Oh, and of course you’ll love the beautiful sight of the waterfall at Lover’s Leap. It’s definitely an Instagram worthy photo op. Rocky City is located at 1400 Patten Road, Lookout Mountain, GA 30750. Rock City general admission is $19.95 adult, $11.95 ages 3 – 12. Learn more at seerockcity.com. 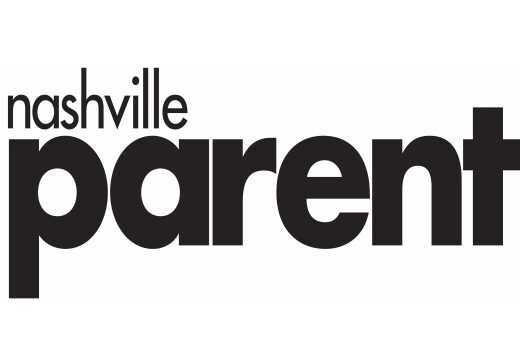 The Tennessee Aquarium recently celebrated 25 years and it just keeps getting better! Two giant buildings (River Journey and Ocean Journey) filled with animals of the water and more will have you occupied for several hours. Kids love to see all the stingrays, alligators, sharks, colorful (and some prehistoric-looking) fish, penguins, butterflies and more. Be ready for a little fear from the little ones as the walk down the levels includes a very dark zigzag-like path between aquarium tanks that are almost the height of the building! It can really do a number on your equilibrium. But, don’t worry. That fear is gone the moment you walk through the exhibit area on the next level. Last year, the Tennessee Aquarium opened Lemur Forest featuring endangered Ring-tailed and critically endangered Red-ruffed Lemurs. General admission is $29.95 adults, $18.95 ages 3 – 12, free ages younger than 3. Tennessee Aquarium is located at 1 Broad St. Learn more at tnaqua.org. Of course, another of the most widely known attractions in Chattanooga is Ruby Falls. 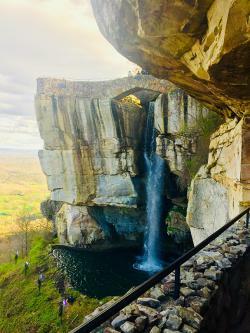 It’s a 145-foot waterfall located deep within Lookout Mountain. It stays a cool 60 degrees year-round inside and is America’s deepest commercial cave and tallest underground waterfall open for public viewing. There’s a new light and sound show at the waterfall this year, too. Ruby Falls is located at 1720 South Scenic Hwy. General admission is $19.95 adult, $11.95 ages 3 – 12. Learn more at rubyfalls.com. Unlock your inner child (with your child) at the Creative Discovery Museum. Two full floors of imaginative fun await all ages. The newest exhibit, Daniel Tiger’s Neighborhood, A Grr-ific Exhibit, is on display through Sunday, Sept. 9, 2018. You can step inside the Clock Factory to play with a variety of clocks, create stories through the Movable Character Mural, compose a song or play along with one-of-a-kind instruments, read a book in O the Owl’s Reading Nest and more. My kids really loved digging around in the sand at Excavation Station. They used tools to push the sand around in search of fossils on the ground below. There are several hands-on stations for creating art and more, too. You’ll spend hours here. So, be prepared. Our kids were hungry and tired after a day of fun. Creative Discovery Museum is located at 321 Chestnut St. General admission is $14.95 ages 2 and older (however, a new price goes into effect June 1, 2018). Learn more at cdmfun.org. Conquer your fear of heights at High Point Climbing and Fitness. 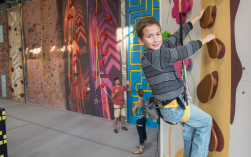 Kids will love gearing up and exploring the rock walls in the Kid Zone. There are 3,000 square feet of climbing space in the Kid Zone, too. Kids can enjoy 15 auto belays and a 10-foot tall kid’s boulder and kids as young as 3 years old can enjoy climbing in this area. The Kid Zone is included in any Day Pass or membership, too. This indoor rock climbing facility also offers an outdoor transparent wall that’s attached to the side of the building. It’s really cool to watch climbers as you pause from your walk down the street. High Point Climbing and Fitness is located at 219 Broad St. Cost for a day pass is $17 adults, $15 ages 10 and younger — this does not include gear rental, which prices vary. You must also sign a waiver. Learn more at highpointclimbing.com. Go wild for the animals at Chattanooga Zoo. Get a look at the habitats in the Gombe Forest featuring chimpanzees, black-crested mangabey, a sand boa, servel and more. The Corcovado Jungle features jaguars, kinkajous, spider monkeys, tamarins and more. See red pandas play and snow leopards prowl in the Himalayan Passage. There are more animals to see here than you would think. Take the time to explore each section of the zoo before heading over to the Warner Park Ranch for the petting zoo. Chattanooga Zoo is located at 301 N. Holtzclaw Ave. Cost is $10.95 ages 13 and older, $7.95 ages 3 – 12, free ages younger than 3. Learn more at chattzoo.org. Find your comfort food at Blue Plate. This diner with a view of the river offers che-prepared dishes from scratch using homegrown ingredients from local farms, bakeries and ice cream shops. 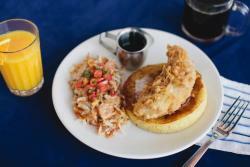 For breakfast, you’ve got to try the Chicken & Pancake (pictured above). You’ll find sandwiches for lunch like the Loaded Grilled Cheese, Double Diner Burger and more. The Open Face meals include Crab Cake Sandwich, Egg Salad & Avocado, and more. The dinner options will have your mouth watering, too. Just check out the menu! They serve breakfast all day, too. Blue Plate is located at 191 Chestnut St., Unit B. It’s super close to the Aquarium, too. Which gives you a good meal option while you’re there. Learn more at theblueplate.info. Kids love hot dogs, right? Then you’ve gotta take ’em to Good Dog. There, you’ll find your standard hot dog that you can top with just about anything. However, you should really give a specialty dog a try. For instance, the The DoggFather (with homemade garlic and herb cream cheese, homemade pesto, and grilled peppers and onions) or the Pimento Cheese or the Reuben or the … Oh, you’ll want to try them all! Good Dog is located at 34 Frazier Ave. Learn more at eatatgooddog.com. If you’re just looking for a quick and easy pizza pickup, then give Lupi’s Pizza Pies a call. You can dine-in, too. The pizzas are made with homemade dough and sauces and are hand-tossed. There are more than 30 toppings to add to it as well. They have more than just pizza, too. There’s homemade lasagna, calzones, Caprese salad, bruschetta and more. Lupi’s Pizza Pies is located at 406A Broad St. Learn more at lupi.com. After a day of running around with the kids, cool off with a special treat at Clumpies Ice Cream Company, which recently opened a fourth location in the area. Each batch of Clumpies ice cream is made by hand using ingredients like ice cream mix pasteurized by Clumpies, fresh milk and cream and house made cookies, cakes, chunks, jams and sauces. They churn their ice cream in small batches, 10 gallons or less at a time, for a slow process that results in a creamy and rich end result. Clumpies Ice Cream Company is located at 1401 Market St. Learn more at clumpies.com. For easy and affordable access to all the attractions, you’ll want to book your stay with SpringHill Suites by Marriott Chattanooga Downtown. We absolutely loved the river view and the fact that it’s walking distance to the downtown area. Along your walk, there’s a playground, too. Which is a great spot to stop and let the kids unwind a little more. Then it’s just a little more down the way to get to the aquarium. The hotel also has an indoor pool and hot tub. It’s not very big, so swimming can be somewhat difficult if you hit the peak season. Otherwise, it’s just big enough for the kids to have some fun while you sit pool side knowing you can reach them in a jiffy if you need to. SpringHill Suites is located at 495 Riverfront Pkwy. Learn more at marriott.com/hotels/travel/chash. But, if you’re up to a unique stay, definitely check out the Chattanooga Choo Choo. Long before I became a parent, we took rides on this famed railroad. Now, with expert planning and booking well in advance, you can stay the night in one of the Pullman Train Cars! The rooms are housed in train cars dating back to the 1930’s, 40’s and 50’s and feature a queen size bed. Some train car hotel rooms also include a daybed with a pull-out trundle bed. There is more to do on the grounds of the Terminal Station, too. For instance, there’s an escape game on a train car! Chattanooga Choo Choo is located at 1400 Market St. Learn more at choochoo.com.